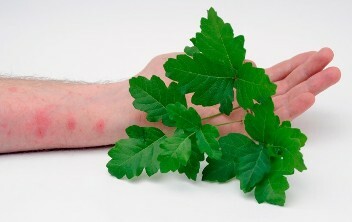 About half of the people who come in contact with poison ivy, posion oak, or poison sumac would develop skin rashes. Poison ivy, oak, or sumac is due to skin sensitivity to the plant's oily resin called urushiol, which is found in its leaves, stems, and roots. In severe cases when the plants are burnt, inhalation of its smoke can cause severe lung inflammation, presenting with an acute asthma attack or even respiratory failure. Depending on the amount of exposure, skin rashes can be mild to severe with blister forming. It is a delayed type hypersensitivity so skin rashes usually develop 12 - 48 hours after exposure and can last from two to three weeks. After exposure, you should wash your skin with soap and warm water within 30 minutes to limit its oil to enter the skin. Clothes should also be changed, washed and try not to touch the area that has the resin oil with your finger. Mild skin inflammation can be treated with lotion and OTC topical steroid. Severe cases are needed to be seen by a physician and may required oral steroid.